Primeape is this high up (over much more deserving Pokemon, honestly) because it just cracks me up. It's litchrally just a fighting monkey, but it's also kind of a pig with that nose. More importantly, when it battles in Pokemon Stadium, it's always throwing those arms around like it's lost its bones. I'm pretty sure all of its joints are shackled, too, which makes the fact it can fight at all even more impressive. Anyway, Primeape is not going to blow you away with its stats. It's got very good Attack and pretty decent Speed. Everything else is lackluster, to put it nicely. But sometimes you just need a little pig monkey to brighten your day. There's nothing wrong with that. The ape also gets more aggressive as it gets angrier. So it's basically a close relative of a human. 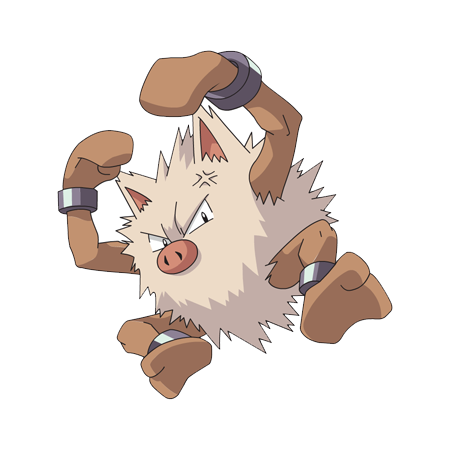 Move-wise, Primeape has some more options after Generation I, but the two you'll for sure want on this go-around of the monkpig are Submission and Rock Slide. Submission of course utilizes STAB and packs a good wallop, while Rock Slide can at least give you a fighting chance against Flying types. "Fighting chance." I'm so witty. Primeape learns Dig, but sadly doesn't learn Earthquake. If you really want to put a Ground-type move on, go for it. It also randomly can pick up both Thunder and Thunderbolt. I don't recommend either because Primeco's Special stat is so low, but hey, there aren't a lot of other choices. Double-Edge is a good Normal-type move, or if you want the joy of lesser power but almost always getting a critical hit, Karate Chop is not a bad alternative. Plus it just seems more fitting that Primeape would use a karate chop move. After all, its hands are already natural boxing gloves, so I'm sure it can take the pain that normal karate chop deals to the user's hand. Have you ever tried karate chopping something? It HURTS!